Riley Nines for 1929 were: the Monaco and the Biarritz Silent Saloons, the Two Seater Coupé, the Four Seat Tourer and the Special Tourer. 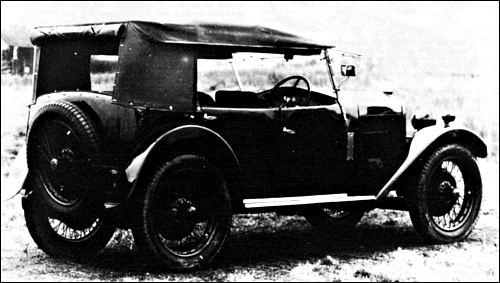 The range continues into 1930, with an improved Monaco which now has a full-width boot, the fabric bodied Four Seater, the Two Seater with metal panelling, the Special Tourer and the Biarritz. The 'Special' Series has twin caburetter, Duplex Hartford shock absorbersadd guaranteed speed of 65 m.p.h. 1. Wider, more durable and lighter coachwork. 2. Radiator of improved design. 3. Radiator shell and bright parts in Firth's stainless 'Staybrite' steel. 4. Petrol tank at rear with increased capacity, to 7.1 gallons, and fitted with electric petrol gauge. 5. Improved tool locker underneath the bonnet. 7. Finger tip controls on the steering column for lamps, dipper, ignition, horn and mixture with independent hand throttle. 8. Improved, illuminated instrument board, with cubby holes. 10. Jacking points on front and rear axles at the same height. 11. Batteries at rear instantly accessible from hinged rear seat. 12. Hinged rear seat giving access to rear shock absorbers. 13. Leveroll seat slides with more comfortable front seats. 14. Better and more comfortable suspension with 'Silentbloc' bushes. 15. Flanged exhaust joints which entirely prevent leakage of exhaust gases. The Monaco and the Biarritz will be available as the Sunshine Saloon versions. 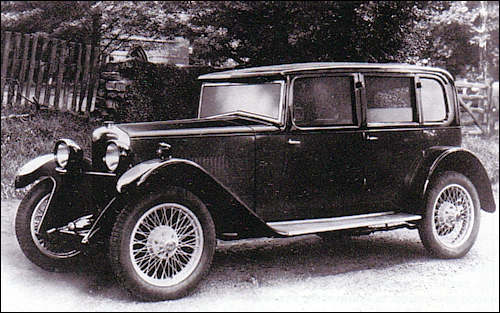 Nine Monaco Plus Series Saloon 1931 model. The Monaco Special is a hotted-up edition of the standard Monaco saloon, and consists of the latter car with just those modifications which an enthusiastic owner would most desire, and which gives it just that extra performance which makes driving a real pleasure. Fitted with two carburettors and slightly higher-compression pistons than the ordinary Monaco, it achieves snappiness without roughness, and speed without loss of flexibility. 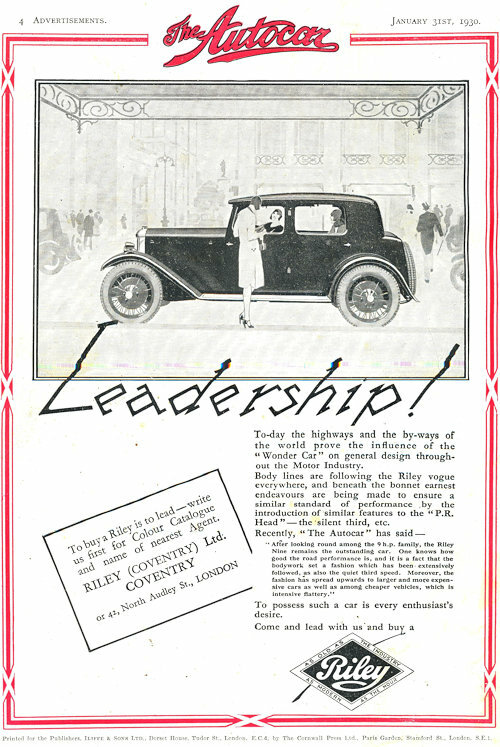 One sees so many Rileys on the road performing with distinct verve that one is liable to take that performance for granted, and forget the exact size of the engine which is responsible for it. After the first few miles on the Monaco Special, I was frequently forgetting this fact myself, and it was certainly hard to realise that a comfortable saloon with such a performance could be propelled by an engine which is within the 1,100 c.c. limit. Naturally, to get the best out of a small engine, fairly liberal use must be made of the gearbox. 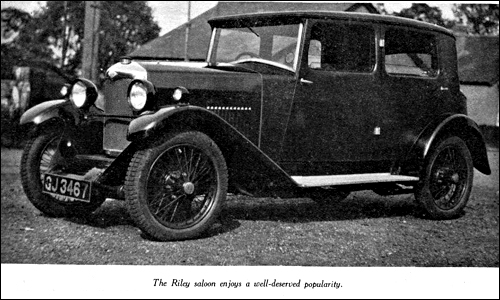 On the Riley, however, even this fails to remind one of the small engine capacity, as the change is so handy and pleasant that it becomes practically automatic, while a third speed that is really silent makes the use of this gear a sheer joy on twisty roads or hills. The car I tried had lines marked on the speedometer at 22 m.p.h. in second, 40 m.p.h. in third, and 65 m.p.h. in top gear, presumably to show the maxima in these gears. However, such a glutton for revs., was the engine that the needle kept stealing past the lines without any fuss being apparent. Maximum speed in top on the level, without any assistance from the winds or the laws of Isaac Walton, is just over 65 m.p.h. On several occasions, however, aided by these, 70 m.p.h. was reached, and held, and the road holding remained very definitely good. To build a saloon body which combines comfort with good looks, and ample passenger and luggage capacity with good performance, is no easy task, and the makers are to be congratulated on the success they have achieved in this. The car was steadier on corners than a great many open models, and high average speeds, the real test of any car's performance, could be maintained with safety and comfort. Another time when the engine size was brought into pleasant prominence was when filling up with fuel. Thirty miles and over can be covered on one gallon, driven hard, and to the man who has to cover considerable distances in a hurry, this is an important point. The brakes are light to operate and free from chatter, and brought the car to rest from 40 m.p.h. in 75 feet. They showed a slight tendency to come on harder on the back wheels than should be the case in relation to the front. This, however, being a mere matter of adjustment to individual tastes, is hardly worth comment, except to suggest that the braking figures would be even better if an alteration were made. The car is fast, economical, and above all, pleasant to drive. It is not a racer, and is not intended to be, but its capabilities place it high in the ranks of sports cars. 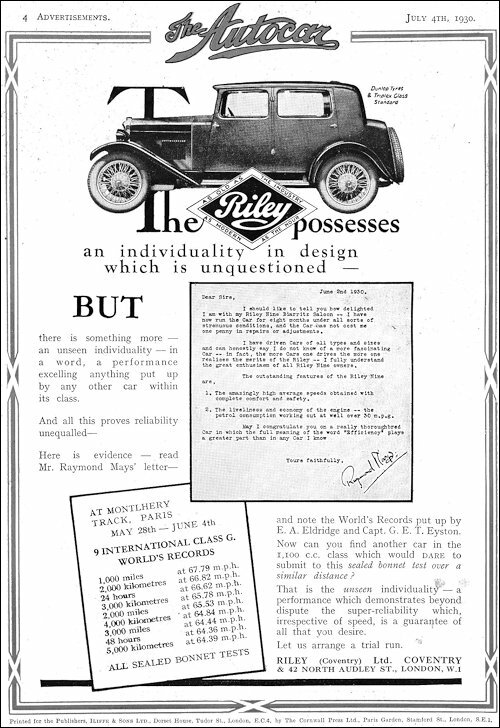 The first six-cylinder Riley based on the Nine principle was introduced in late 1928. Three body styles are offered: Stelvio Fabric Saloon at £495, Deauville Coachbuilt Saloon at £525 and the Special 5 Seat Tourer at £455. 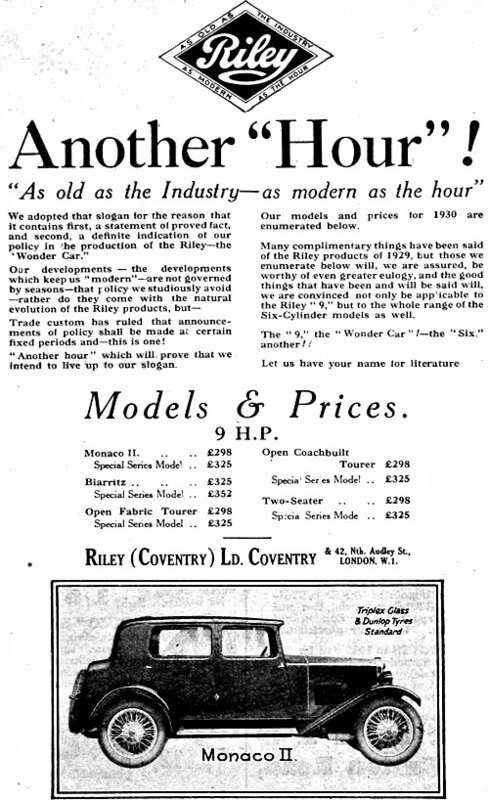 In October 1929 a new, lighter version was launched with shorter wheel bas and some refinements to the engine. The new Light Six chassis has 9 ft. 6 in. wheelbase and 3 ft. 11¾ in. track, employing many parts in common with the 9 h.p. range. Axles, gearboxes, wheels and steering gear are borrowed from the smaller models. The Six is almost a 'Nine-Plus-Two'. Even the bodies are similar with just longer bonnet. For 1931 the 14/6 will be offered as the Six (Long) and the Six (Short). The long models continues with the Stelvio and the Deauville. 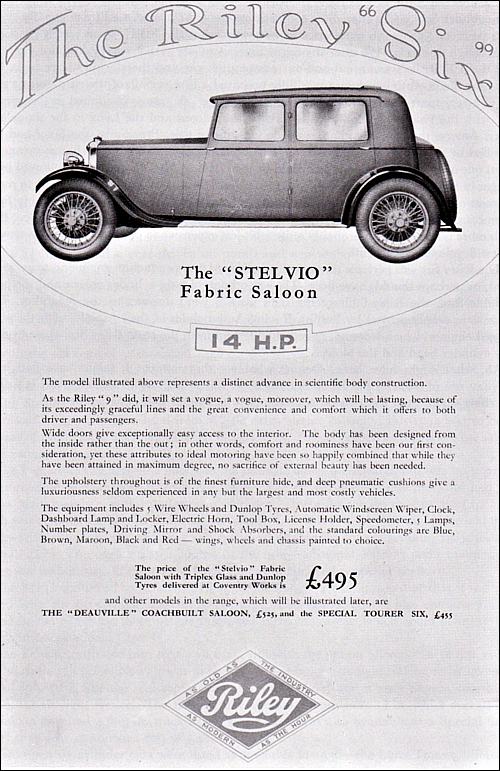 The Six short features the Alpine Fabric and Half-Panelled Saloons and the Alpine Tourer. The chassis of the Brooklands is totally different, much lower than the standard Nine from which it originates. The engine is fitted with water pump in place of thermosyphon system and an elecric fuel pump is used instead of standard gravity feed. 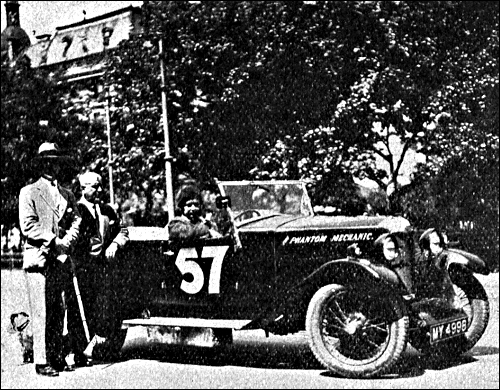 The racer is another story, and one for which thanks are due to Mr. Ashby, who at the time I was temporarily in charge of the Monaco was getting his own Riley ready for the Whitsun meeting of the B.A.R.C. Later he kindly gave me the chance of trying this model, and thus I was able to discover a Brooklands Riley as it should be. Readers may protest that this is not a standard car and therefore no criterion, but it should be realised that for a car to be eligible for the International standard car races, as this one is, no radical alterations are permissible. And when it is further mentioned that the car was running on ordinary benzol mixture, it will be understood that no freak timing setting had been employed. As to the handling of the car, no more need be stated than the fact that it was that of a thoroughbred in perfect fettle. The controls and feel of the car inspire immediate confidence. The steering was light and accurate, so light, in fact, that I would have preferred it to be slightly higher geared on a "scrapping" vehicle. This is, of course, so much a matter of argument and personal taste, that to criticise it is to tread on dangerous ground. The fact remains, however, that when only a small move ment is required, a skid may be caught and held quicker than when the necessary movement of the front wheels needs a larger movement of the steering wheel. At the track practising was in progress for the "round the mountain" races, so I had a few laps of this as Mr. Ashby's mechanic. Having satisfied himself that the model was in order, and having cheerfully pushed the rev, counter needle round to the 6000 r.p.m. mark in second, he turned the car over to me to try round the course for myself. Not wishing to spoil someone else's motor car, I kept the revs fairly well down in the "fives," and found useful change-up speeds to be just over 50 m.p.h. in second and 75 m.p.h. in third. Owing to the specially lowered chassis, and the low seating position, the gear change is brought back well aft of the box, and is in a very handy position. Needless to say, the brakes were in perfect adjustment, and very powerful. Coming down to the fork from behind the hill, just over 80 m.p.h. was held to the end of the Vickers sheds, which gave me comfortable distance to brake, change down to second, and swing round the fork hairpin comfortably at 25-30 m.p.h. 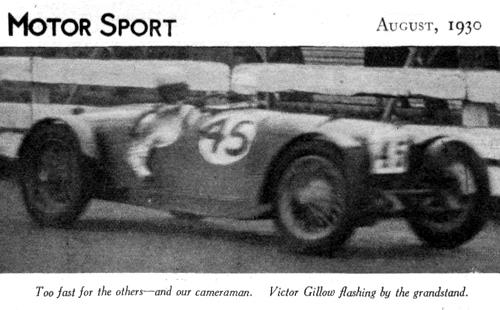 This says a lot for the braking and steadiness of the car on a rough surface, as it must be remembered that, being strange to the car, I was not chancing any fancy tricks, and was not "racing." Following an interval for refuelling (ourselves, not the Riley), it was put through its paces round the track itself, and proceeded to show that 100 m.p.h. was not beyond its capabilities. The steadiness and lack of fuss was amazing, and there was nothing but the roar of the wind, and those silent needles on the instrument board to show that an 1100 c.c., 4-cylinder, supercharged engine was propelling the car at a three figure speed. Mr. Ashby, as we know, can build a little more speed into an engine than most people, but for a motor of this size to be capable of such pace and vim, the design and construction must be absolutely first class. 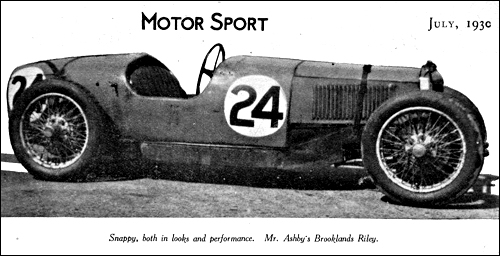 As for the question of reliability, the recent records set up by a Riley saloon at Monthlery, and the third place by Whitcroft's Riley in the Double Twelve, make further comment on this point superfluous. Class G Records. Monthlery; Riley Nine; 1000, 2000, 4000 miles; 2000, 3000, 4000, 5000 km; 24 and 48 hours. Speeds between 64,36 and 67,79 mph. New York to Los Angeles Record; Riley 9; 4,200 miles at 41 m.p.h, average.